Our guide to Salt Lake City will help you find the best vegetarian restaurants in Salt Lake City Utah. Sitting at the foot of the rugged Wasatch Mountains and extending to the south shore of the Great Salt Lake, Salt Lake City has some of the best scenery in the country. The interface between city and nature draws residents and visitors alike to the Salt Lake Valley. There are few other places where you can enjoy urban pleasures and, within 20 minutes, hike a mountain trail or rest by a rushing stream. The city is emerging as a prominent economic center in the Rocky Mountains. Since 2001 the number of people living in the Salt Lake Valley has climbed from 720,000 to more than 1 million. As a reflection of this growth, a dynamic skyline has sprouted, along with ever-widening rings of suburbia. Smog occasionally bedevils the town, and some crime exists, but Salt Lake is working hard to remain a small, personable city. Near Salt Lake City, Antelope Island has superb hiking, mountain biking, and wildlife watching. American history buffs might choose to travel one of the best-preserved sections of the original Pony Express Trail, the 133-mi section through the desert of west-central Utah. There are tons of great vegetarian restaurants in the city of Salt Lake City, our city guide will help you find the best vegetarian restaurants. You may have a hard time deciding what to do in Salt Lake City, but we make your decision easy. 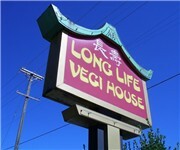 1353 E 3300 S, (801) 467-1111 - Long Life Vegi House is a vegetarian restaurant located in Salt Lake City UT. 145 E 1300 S, (801) 322-1841 - Shanghai Cafe is a vegetarian restaurant located in Salt Lake City UT. 1515 S 1500 E, (801) 484-9259 - Mazza Middle Eastern Cuisine is a vegetarian restaurant located in Salt Lake City UT. 2065 Ft Union Blvd, (801) 944-0444 - Wasatch Pizza Co is a vegetarian restaurant located in Salt Lake City UT. 2148 Highland Dr, (801) 486-0332 - Living Cuisine Raw Food Bar is a vegetarian restaurant located in Salt Lake City UT. 2250 W 5400 S, (801) 966-4652 - Wasatch Pizza is a vegetarian restaurant located in Salt Lake City UT. 2280 SW Temple, (801) 484-8378 - Vertical Diner is a vegetarian restaurant located in Salt Lake City UT. 2731 Parleys Way, (801) 581-0222 - Bombay House is a vegetarian restaurant located in Salt Lake City UT. 300 S 200 W, (801) 535-7917 - City Dogs Cart is a vegetarian restaurant located in Salt Lake City UT. 3142 Highland Dr, (801) 582-8424 - Bangkok Talay is a vegetarian restaurant located in Salt Lake City UT. 3298 Highland Dr, (801) 466-0054 - Tres Hombres Mexican Grill is a vegetarian restaurant located in Salt Lake City UT. 55 E 400 S, (801) 363-7555 - Star of India is a vegetarian restaurant located in Salt Lake City UT. 754 E S Temple, (801) 328-8424 - Sawadee Thai Restaurant is a vegetarian restaurant located in Salt Lake City UT. 755 S State St, (801) 328-8889 - Ever Green House is a vegetarian restaurant located in Salt Lake City UT. 792 E 3300 S, (801) 466-7777 - Wasatch Pizza Co is a vegetarian restaurant located in Salt Lake City UT. 820 E 400 S, (801) 359-2300 - Wasatch Pizza Co is a vegetarian restaurant located in Salt Lake City UT. 4515 S 900 E, (801) 268-2423 - Taj India is a vegetarian located in Salt Lake City UT. There are plenty more vegetarian restaurants in Salt Lake City. 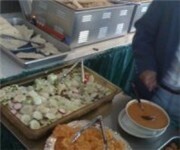 See all vegetarian restaurants in Salt Lake City Utah.